Sunday, July 24, 2011, a hot, very hot, Sunday afternoon, moderate winds, Sky Squires Field, Marion, Illinois, and a buddy box with Jacob Foster, neophyte flier on one end and Wes Flannell, full scale licensed pilot and expert RC pilot on the other. Look at those faces! A study in concentration! Jacob is going to be a third grader this year at Washington School in Marion Illinois and has been practicing for about a year on a computer Great Planes RealFlight G5 flight simulator. He also likes motorcycles and three-wheelers. His first buddy box lesson, with Doug Gwaltney, came a few years ago. The airplane that Jacob and Wes were flying is a Tower Hobbies Hobbico Super Star 40 that used to be his dad's. 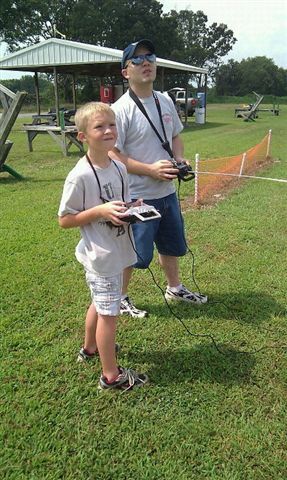 Tim Foster did not get to learn RC flying as a boy, but like many others he started with RC Cars as a teenager. Tim's first airplane came along a few years later. Again, like many others, he ended up crashing it while trying to teach himself to fly. Tim, who has had an interest in RC for as long as he can remember, came to the Sky Squires for help the year the club moved to its present location five years ago. He joined in enthusiastically with other club members in helping to clear trees for the field. Tim's present models are a Hanger 9 Twist 60 airplane and a Thunder Tiger Raptor 50 helicopter. He also has part ownership of the Hobbico Super Star Wes and Jacob were flying. Wes Flannell's history with RC flying is different from Tim's, probably because his father, Larry, was deeply into model aviation when Wes was growing up. Wes, now an Emergency Medical Technician at Johnson County Ambulance Service, is a private, full scale pilot going to school, majoring in Aeronautics, started flying in 2001 at the age of twelve tutored by his father. He learned to fly RC on a Hobbico Superstar trainer, too, which he allows "is a very good trainer." During the ten years that he has been flying, Wes has mastered all the forms of RC aircraft. His current passion is 3D aerobatic airplanes. Wes has trained any number of new club members and helped members test fly their new models. Jacob on the box got a good appraisal from his buddy: "Though bashful at first, he seemed to really enjoy it. He'll be flying solo in no time." It seems that with a good buddy and a box, Jacob's model aviation experience might follow Wes's example-and that's a good thing! A saga is supposed to have a beginning so far back in time that nobody can remember it. Well, that's certainly true of Big Bird. I know he was old when he came to me. I don't know how he got started, or anything about his early life, but I do know how his saga ended.